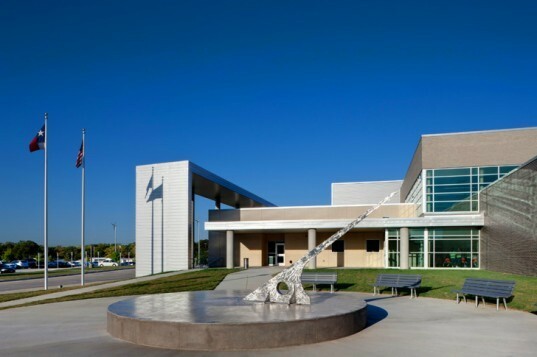 Texas is known for the Alamo, spicy Tex-Mex food, big Stetson hats, and now it also has the nation's largest net-zero public school. Welcoming its first students this past fall, the Lady Bird Johnson Middle School in Irving Texas is a 152,000 square foot facility that produces as much energy as it uses thanks to wind turbines, solar panels, and a slew of the most advanced green technologies and building techniques. Dallas-based firm Corgan Associates led the design team, which incorporated a variety of experts to create a school that serves not only as a classroom, but also as a teacher of sustainability and energy-efficiency. Lady Bird Johnson Middle School’s green features are apparent from the moment one approaches the school, as 12 wind turbines rise 45 feet into the air alongside the building. 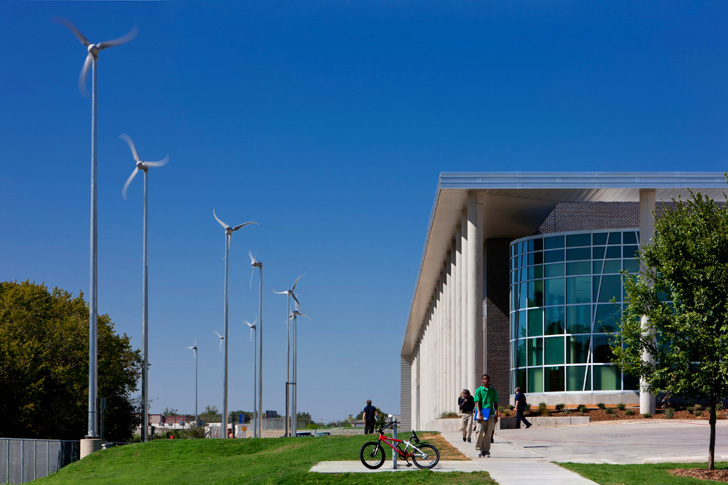 While visually impressive, the wind turbines actually only produce 1 percent of the school’s power needs. The other 99 percent is generated through the 2,988 Solyndra panels on the white roof that contain cylindrical tubes that capture sunlight from 360 degrees. Any extra energy produced is directed back to the regional grid. The renewable energy production is coupled with a highly efficient building. 105 geothermal heat pumps help the HVAC system use about 30 percent less energy, and high-performance materials from Fabral Metal Wall and Roof Systems were used for the building’s physical structure. Insulated wall panels, sun shades, and light shelves are a few of the recycled and sustainable Fabral materials used. To help block the hot Texas sun from overheating the building, a large canopy was constructed on two sides of the building to help shade the windows. Since the school serves as a learning laboratory, the regular K-12 cirriculum has been supplemented with lessons that focus on the school’s energy-efficiency. As noted on the school’s interactive website, “Elementary students may study the differences in solar energy production on a cloudy day versus a sunny day, while high school students may calculate the school’s average geothermal output.” Additionally, there is a viewing platform on the roof so students can examine the photovoltaic array, and energy monitors are placed throughout the hallways so students can see exactly how much energy the school is using at any given time. In constructing the building, the school district’s main concern was energy use, but they are also seeking LEED certification. Lady Bird Johnson Middle School is not only a beautiful structure, but also a perfect example how green design can be incorporated into our everyday lives as an educational tool. Here’s hoping that more schools around the country follow suit. The school is in an auto dependent area but the children are able to walk and a lot of them do. My son is one of the many that does. The majority of the kids that get driven are dropped off by parents on their way to work. The school has panels that tilt to allow more sun and heat or reduce it into the school also reducing its need for energy use. The school is not only energy efficient but uses lower CO2 materials in the library (the only room with carpeting) to reduce air pollution. The schools uses a minimum amount of paper. All schoolwork is done on iPads or HP netbooks. All of the lunch materials are recyclable and are then composted after use.The school is attempting to be as green as possible. This is great, but the important part of this achievement should be the design effort that went into reducing energy consumption. Any school in a rich district can install enough solar panels to make it net zero - please tell us more about design that went into energy efficiency in these articles. Its all right, but net zero doesn't anything to fix the fact that its an auto dependent location. I would rather have a non-net zero school in a location where the kids can walk to school then a net zero school any day. It uses less energy not to mention all the other benefits. This school is a shining example of what can be accomplished with today's technology and good design. I hope school districts all over the world take noe. Lady Bird Johnson Middle School's green features are apparent from the moment one approaches the school, as 12 wind turbines rise 45 feet into the air alongside the building. While visually impressive, the wind turbines actually only produce 1 percent of the school's power needs. The other 99 percent is generated through the 2,988 Solyndra panels on the white roof that contain cylindrical tubes that capture sunlight from 360 degrees. The renewable energy production is coupled with a highly efficient building. 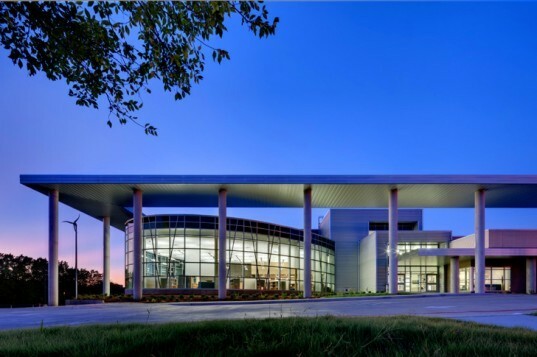 105 geothermal heat pumps help the HVAC system use about 30 percent less energy, and high-performance materials from Fabral Metal Wall and Roof Systems were used for the building's physical structure. Insulated wall panels, sun shades, and light shelves are a few of the recycled and sustainable Fabral materials used. To help block the hot Texas sun from overheating the building, a large canopy was constructed on two sides of the building to help shade the windows. "This structure blocks the hot Texas summer sun from passing through classroom and other windows while still allowing natural lighting," notes Fabral. "In the winter, when the sun is lower in the sky, the rays pass directly through the windows, providing warmth and heat to the building." The width of the canopy was determined by analyzing the sun angles during the times and months when students are in their classrooms. Native vegetation was planted on the grounds of the school. Since the school serves as a learning laboratory, the regular K-12 cirriculum has been supplemented with lessons that focus on the school's energy-efficiency. As noted on the school's interactive website, "Elementary students may study the differences in solar energy production on a cloudy day versus a sunny day, while high school students may calculate the school's average geothermal output." Additionally, there is a viewing platform on the roof so students can examine the photovoltaic array, and energy monitors are placed throughout the hallways so students can see exactly how much energy the school is using at any given time. There are museum-quality science exhibits on display throughout the school. In constructing the building, the school district's main concern was energy use, but they are also seeking LEED certification. Lady Bird Johnson Middle School is not only a beautiful structure, but also a perfect example how green design can be incorporated into our everyday lives as an educational tool.